Things are happening fast in that garden of yours, so let’s get right down to business. Sharpen your pruners more than once a year! Have a flat metal file in your tool bucket and use it often. Position the file at a 45 degree angle to the blade, start at the bottom of the blade where the handles are and draw the file in an upstroke towards the tip. Important: file only in one direction. Repeat until you have a nice, sharp edge. Since that file is out, sharpen your edger, shovel and loppers as well. It’s important to sterilize your pots so you don’t spread a nasty organism that might stunt or kill you new plant, but many people don’t like using bleach (and it’s not good to use on clay pots which can absorb the bleach solution). Here’s an alternative to bleach: wash your pots well in warm soapy water and rinse with 1 cup white vinegar in 2 gallons of water. I buy white vinegar by the gallon, it’s cheaper and I always have it on hand for cleaning. 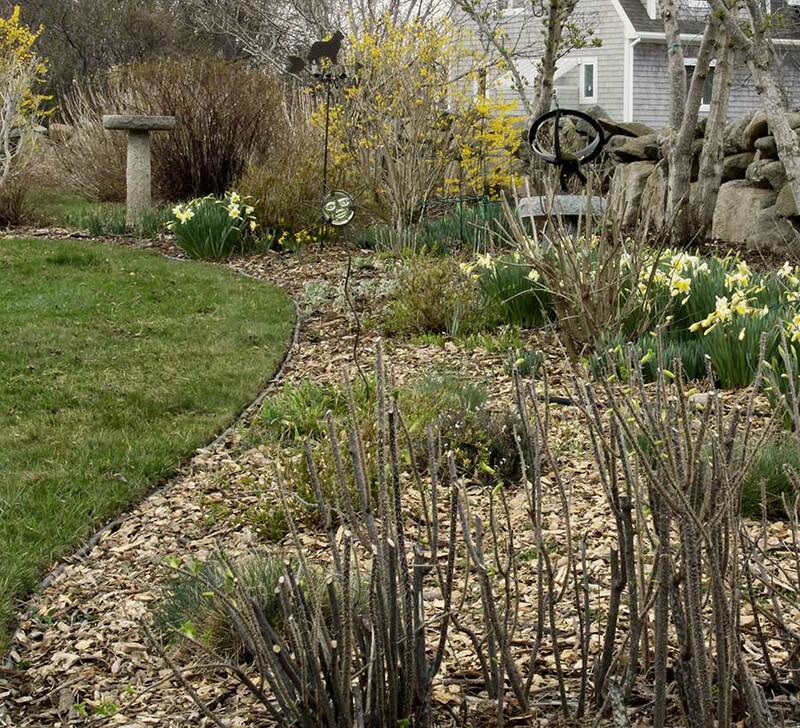 Spruce up your beds with an edger and mulch — nothing looks better than a bed that’s just been edged and mulched. 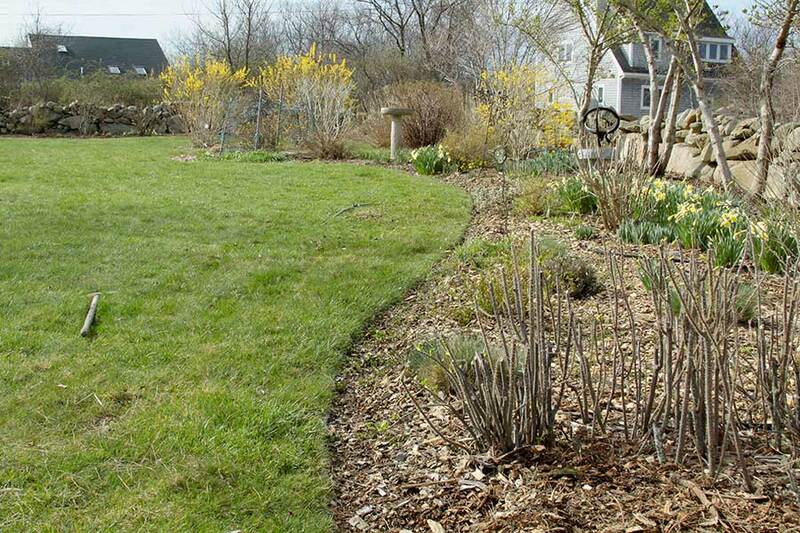 Edging keeps grass from creeping into your plant beds. The mulch will keep weeds down, retain moisture, and moderate soil temperature reducing plant stress especially in hot weather. Using an organic mulch encourages beneficial soil organisms and worms. And, as the mulch decomposes, it adds organic matter that will improve both the texture and fertility of your soil. Before cleaning up the edge. After — that looks so much better! White vinegar works wonders (though just as smelly as bleach, lol! ), this is a great tip! I look forward to one day being able to garden in-ground again. (Right now I’m almost exclusively container gardening because of where we live). Beautiful edging & photo’s! Thanks Jo! I’m happy I have a yard to work in but I love container gardening too. Buying or should I say drooling over beautiful pots of all shapes and sizes is right up there with buying plants when I go to the nurseries!! A little “good love” gets things done around here too! I know Mary Beth, believe me I know, lol! I’m trying to be very good and not buy any new containers this year & make do with what I have. Maybe I’ll spruce them up a bit with some paint on the outside (most of my containers are plastic & are now quite a bit faded) or not, we’ll see!